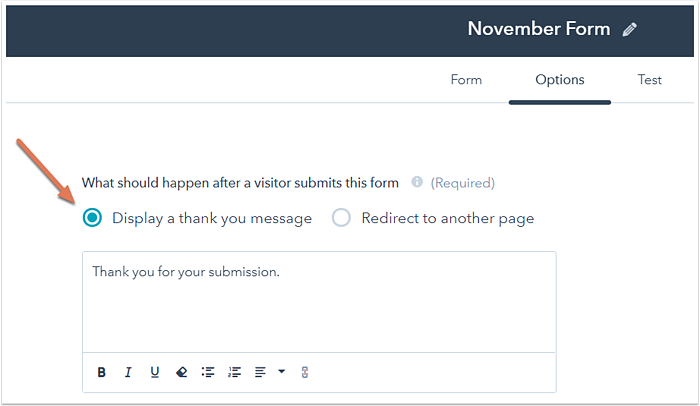 Forms can be shared in two ways on your external, non-HubSpot-hosted site. With either method, any change made to the form in HubSpot's forms tool will be automatically reflected on the live form on your external site. 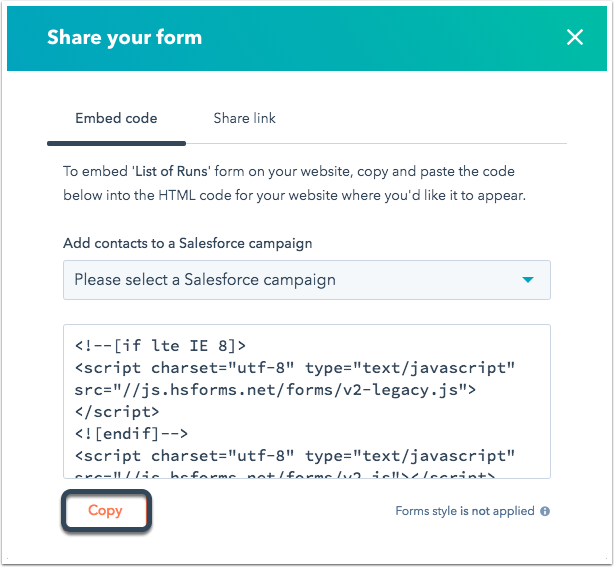 Please note: if you associate a Salesforce campaign with your form, the form's embed code will be changed. In this case, you must re-add the embed code to your external site. Click the name of your form. Click the Options tab to choose what will happen after a visitor submits your form. You can choose to redirect your visitors to a thank you page or display an inline thank you message when a visitor submits your form. In the upper right, click Share. In the dialog box, if you want to add contacts who submit the form to a Salesforce campaign, click the Add contacts to a Salesforce campaign dropdown menu and select a campaign. Paste the embed code into the desired location of the HTML on your external page. Your HubSpot tracking code must be installed on any external page where you place a HubSpot form. Learn how to style your embedded form. 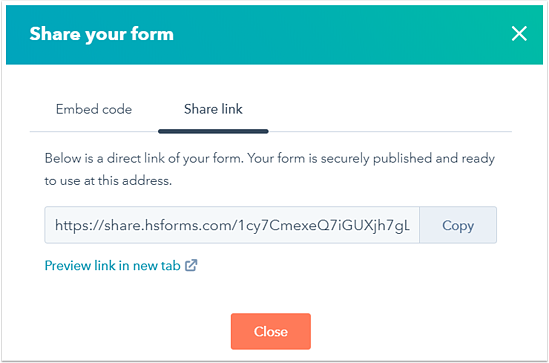 You can share your form via a form page so it will exist on its own page at its own URL. In the dialog box, click the Share link tab. Click Copy to copy the form page's URL to your clipboard, then click Close. In your browser, open a new window or tab and paste your form page's URL in the address bar to load it. You can also share the form page URL directly with others to give them access to the form.